The good news is that this quote may have identified the crux of the matter. NBC -- people who can be credited with knowing virtually nothing about astrology -- or for that matter, anything under the Sun (or born under the sign of Leo)... are apparently attempting to regulate Scorpio to only ~6 degrees, while the upstart Ophiuchus subtends three times the span of the zodiac. Shame, shame, shame. To being with, it needs to be pointed out that the Zodiac (i.e., the line drawn in the heavens by astronomers to denote the annual path of the sun across the background of stars) intersects a star or two traditionally included in the foot of the mythological description of Ophiuchus. See Figure 1. On the other hand, Astrology is NOT about the influence of the stars (i.e., the constellations) on people; astrology is about the influence of our local Sun, the Moon, and the planets (including selected dwarf planets). Admittedly, in astrological parlance even the Sun and Moon are often included in the term “planets”, but only because it’s too much trouble to continually write: “The Sun, the Moon, and the planets”. Meanwhile, the phrase, "Ruled by the Stars” is a misnomer (i.e., it's purely for marketing). Antares and Beetlejuice, for example, are not rulers of things on earth... albeit, possibly, in their own localities. On the contrary... and in lieu of the fantastical notion that astrology has somehow purloined the names and alleged attributes of the constellations for its own nefarious purposes... the more likely scenario is that the attributes of the constellations were long ago created in order to match the attributes of the astrologers. There is also something called the Precession of the Equinoxes, i.e., the slow revolution (every 26,000 years or so) of the earth’s axis, such that when the sun is in scorpio in astrology, the sun is not actually in scorpio in astronomy... and in fact is displaced by one sign. This is due to the fact of astrology being 3,000 or so years old, and things tend to shift in the heavens on such a time scale. However, instead of the stars influencing humans, it is more likely the annual cycle of the earth orbiting about the sun is key to astrology (and to a lesser degree the relative position of the planets to the earth at the moment of a person’s birth). For example, if a primary attribute of Scorpio is death, this occurs as the earth recedes toward it greatest distance from the sun. The latter aspect occurs at the end of Sagittarius, a sign “ruled” by Jupiter, and symbolized by philosophy and the meaning of life... attributes consistent with the approach toward death of an earth heading out and away from the life-supporting warmth of the Sun, and then the rebirth of those seeking the meaning of life just before reaching the "end point". In effect, the astrological signs of the zodiac are in fact far more representative of the elliptical nature of the earth’s orbit about the sun... than any star based connection. Another argument that might explain the recent interest in Ophiuchus is that it simply makes no difference that anyone’s astrological sign really influences their behavior, and thus who cares which sign they were “born under”? The implied, faulty assumption of this question is that, for example, a Scorpio is only a Scorpio because as a Scorpio he or she have been told that they are, and thereafter trained to display such attributes. There is an environment (and genetics) over conditions of birth argument here. However, the fact that people who have never been exposed to astrology still end up exhibiting the characteristics of their astrological signs tends to negate this argument. In fact, eons of research continue to show that, “Yup, this astrology works.”  Someone who is “born under the sign of scorpio” does in fact, inevitably display the attributes of a Scorpio... which in general is typically terrifying for all non-Scorpios. Sorry about that. There is the added intrigue that whenever someone has the attributes of the twelve signs of the zodiac explained to them... and then asked which sign would they choose as their astrological identity, they almost invariably choose the sign under which they were in fact born. That is to say, all Scorpios prefer being a Scorpio; Aries prefer being an Aries; and so forth and so on. The only real exceptions are “cusp babies”, people born at the end of one sign or the beginning of another... and who, incidentally, have the ability to exhibit the characteristics of both signs... switching back and forth between the two possibilities, depending entirely upon the sign of the person with whom they are interacting. And of course... the astronomical (vice astrological) reality is that the constellations have a finer line drawn between than is depicted in the fanciful drawings of ancient times. For example, there is this somewhat more diplomatic version, wherein each of the two relevant constellations are each given their appropriate due... and no one is stepping on anyone's toes... or vice versa. 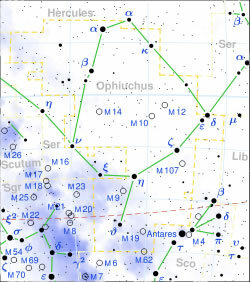 Note that there are only two stars attributed in this depiction to Ophiuchus that actually allow a crossing into the zodiac (the red, dotted line in the above Figure). One is bright enough for a symbol, while the other is insufficient (or else is going incognito) in terms of being awarded a Greek letter for prominence in the heavenly firmament... or for playing on their football team. Meanwhile, note also that Antares is definitely a Scorpio star... while M19 could perhaps go either way. Another possible reason for the recent interest in adding a 13th sign to the zodiac -- besides the number change from the heavenly 12 to the fraught-with-drama possibilities of 13 -- is that by having an Ophiuchus, astrologers are now allowed to write learned treatises, recalculate horoscopes and natal charts, create from scratch informed interpretations, and thereby extend the potential market for their selling their wares. The current recession is the kind of thing that can motivate all manner of actions in order to fill in the gaps of someone’s professional income. Even Medical Doctors -- a reincarnated group of opportunists, if there ever was one -- are increasing significantly their marketing of their products in order to pay for their ever increasing premiums for liability insurance . The astrologers’ traditional use of new discoveries to reinvent their wares goes back to the discoveries of first, Uranus, and then Neptune and Pluto. More recently in 1978, the discovery of Chiron generated a flurry of books on this dwarf planet, a dwarf planet, by the way, occupying a real planet’s orbit ranging between Uranus and Saturn. Even more recently, there has been a proliferation of new dwarf planets beyond the orbit of Pluto (the newly demoted to dwarf planet status, according to astronomers, and yet still the potent, generational planetary influencer, according to astrologers). And suddenly, there are some fascinating astrological discourses on these Transneptunian planets . Meanwhile, according to mythology, Asclepius, the Greek God of Healing, was reputed to be able to resurrect people from the dead... an ability which astoundingly included awakening people following a speech by Al Gore. This earned Asclepius a death sentence -- obviously a Republican Party plot -- with Zeus [the epitome of a Republican King... yes, I know... an oxymoron]... hmmm... where was I? Oh yes!] Zeus then killed Asclepius with a thunderbolt for the latter's audacity in healing the sick -- a very early version of an extremely negative response to health care and its reform. But then Zeus relented ever so slightly... or was pressured by the public opinion of the day to pay the piper in some small, insignificant manner. In any case, Zeus placed Asclepius in the sky as the image of Ophiuchus, the Serpent Bearer. (“The evil men do lives after them, the good are often interred in... well... the stars.”) Meanwhile, Zeus went merrily on his way, with Asclepius dead, buried, and... with a heavenly billboard erected as a meaningless, symbolic gesture... a gesture, in fact, full of sound and fury and signifying absolutely nothing... the latter, a Republican Party tradition. 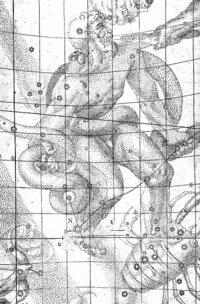 Assuming anyone might for inexplicable reasons want to include Ophiuchus as the 13th astrological sign of the zodiac, then we would strongly suggest including as the primary attribute of Ophiuchus: that all such people also be identified as Opportunists. Note, for example, that in the traditional salesperson’s attributes (those entrepreneurial opportunists), Ophiuchus (Figure 1 above) has managed to stick his foot into the Zodiac, slipping in between Scorpio and Sagittarius. Devilishly clever, wouldn't you say? Obviously, Ophiuchus is about to find out what happens when one steps on a scorpion, and barefoot at that. It’s really, really, really... NOT a good idea to offend a Scorpio. Ye olde Serpent Bearer is about to find out why he will be needing the aid of the nearby constellation of Sobieski’s Shield. By the way Sobieski's Shield [aka Scutum (*)] is the single constellation named after or depicted as a genuine historical figure. In this case, it is the King of Poland who saved Christendom from the Ottoman Turks at the Battle of Vienna on September 11, 1683). Just thought you’d want to know this little tidbit. (*) Note the relationship to Scutum to Ophiuchus and Sagittarius. In the final analysis, Ophiuchus the Opportunist, might claim... oh say 5 degrees in the environs of Thanksgiving, taken likely from Sagittarius’ traditional 30 degrees. I mean... who really cares? Arielle Guttman, “Ophiuchus”, The Mountain Astrologer, January 17, 2011. "The sign of Ophiuchus is patterned after the original 'Serpent Holder', Enki, a Sumerian god." This author, being a fan of Enki, would have to say that the above statement is in her favor. It's just that when she assumes imparting certain positive attributes of Ophiuchus to the likes of Joseph, the Biblical son of Jacob... that's pretty much when we part company. Assuming any commonality between Joseph and Aesclepius, for example, borders on... well... something very, very strange. Admittedly, while it is true that different constellations subtend different degrees along the zodiac... and thus might be accorded greater or fewer days than the traditional 30+ days per sign... one would assume that the correct number of days would be based upon when the zodiac is crossing that sign. Pisces, for example, does subtend considerably more than 30 degrees, and thus might stake a claim to a greater portion of the zodiac. But when there is an overlap between signs... the whole thing gets rather silly. Worse yet, decreasing the sign of Scorpio to roughly six degrees, while the upstart Ophiuchus gets approximately 18 degrees is just untenable. http://www.welt.de/vermischtes/article12043555/Gunter-Sachs-erklaert-den-Einfluss-der-Sterne.html This article is in German, but can be translated using the Google language tool. “Desperate Docs”, The Week, January 14, 2011, page 40. Transneptunians. http://en.wikipedia.org/wiki/Trans-Neptunian_object One might note, for example, Eris, her moon, and how they got their names (scroll down to “Moon”) ... along with a sample of the astrology of seven of these objects.